In this lesson, we will learn the basics behind multiplying fractions and will be using some examples to explain how this multiplication works. It is easier to multiply fractions as compared to adding or subtracting fractions. This is because we don't have to worry about the denominators. a proper fraction and a mixed fraction. When multiplying fractions, the denominators don't have to be the same. Watch the math video below for more explanation. In this lesson, we will learn the basics behind multiplying fractions. Now, compared to adding or subtracting fractions, it is easier to multiply fractions. This is because when we multiply fractions, we don’t have to make the denominators the same. For example, let's multiply, 2/3 with 4/5. To do so, we just need to multiply the numerators together. Therefore, we multiply 2 with 4. This gives 8. Next, we multiply the denominators together. Therefore, we multiply 3 with 5. This gives 15. 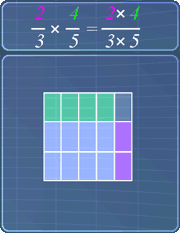 So finally, we can see that this fraction multiplication gives 8/15. Now, let's visually examine how this multiplying fractions work. We can represent 2/3, with this rectangle. Similarly, we represent 4/5, with this rectangle. When we multiply these fractions, visually, it means that we are combining these rectangles. When the green and purple rectangles overlap, they give blue rectangles. Here, we can see that, these 8 blue rectangles are represented by the numerator 8. Also, notice that there are total of 15 rectangles, which are represented by the denominator 15. Alright, let's take a look at more examples on multiplying fractions. Let's multiply, 7/8, with 2/5. First we multiply the numerators. So, we multiply 7 with 2. This gives 14. Next, multiply the denominators. So, we multiply 8 with 5. This gives 40. Now, we have the fraction, 14/40. Notice that, we can simplify this fraction. To do so, we divide the numerator and denominator with 2. This gives the simplified fraction, 7/20. Next example, let's multiply 1/3, with 3 1/2. Notice the mixed fraction here? It is important to change it to an improper fraction before multiplying. To do so, first, we multiply 2 with 3. This gives 6. Next, we add 6 with 1. This gives 7. This 7 becomes the improper fraction's numerator. Hence, we have the improper fraction, 7/2. We can now multiply these fractions. First, multiply the numerators. So, we multiply 1 with 7. This gives 7. Next, we multiply the denominators. So, we multiply 3 with 2. This gives 6. Notice that, 7/6 is an improper fraction. Now, rather than leaving the answer like this, it is recommended to change it to a mixed fraction, by using long division. Here's how. 7/6 is the same as, 7 divides 6. Now, this division gives the quotient 1. This quotient is actually the whole number for the mixed fraction. Next, we multiply 1 with 6. This gives 6. 7 minus 6 gives the remainder as 1. This remainder, 1, is actually the mixed fraction's numerator. So here, we have the answer in mixed fraction, 1 1/6. You can start by going through the questions on Multiplying Fractions or pick your choice of question below.